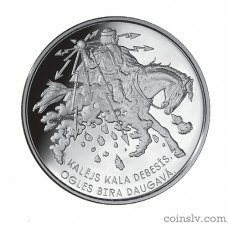 Latvia 5 euro 2017 "Smith forges in the sky"
A rider wearing an ethnographic outfit is featured in the centre of the coin, with his right hand raised and holding an orb shooting nine lightning bolts in various directions; there are clouds and raindrops around the horse; an inscription "KALĒJS KALA DEBESĪS, OGLES BIRA DAUGAVĀ." (Smith forges in the sky, the coals burst into the Daugava) is featured in a semi-circle below the central motif. The upper part of the coin features images of Latvian ethnographic jewellery and raindrops, an inscription 5 EURO and a shawl with a headpiece and jewellery on it are featured underneath, with the inscription of the year 2017 placed to the right. An inscription "ES PAKLĀJU VILLAINĪTI, MAN PIEBIRA SUDRABIŅA." (I spread my shawl on the ground and collect a pile of silver) is arranged in a semi-circle above the central motif. And collect a pile of silver. 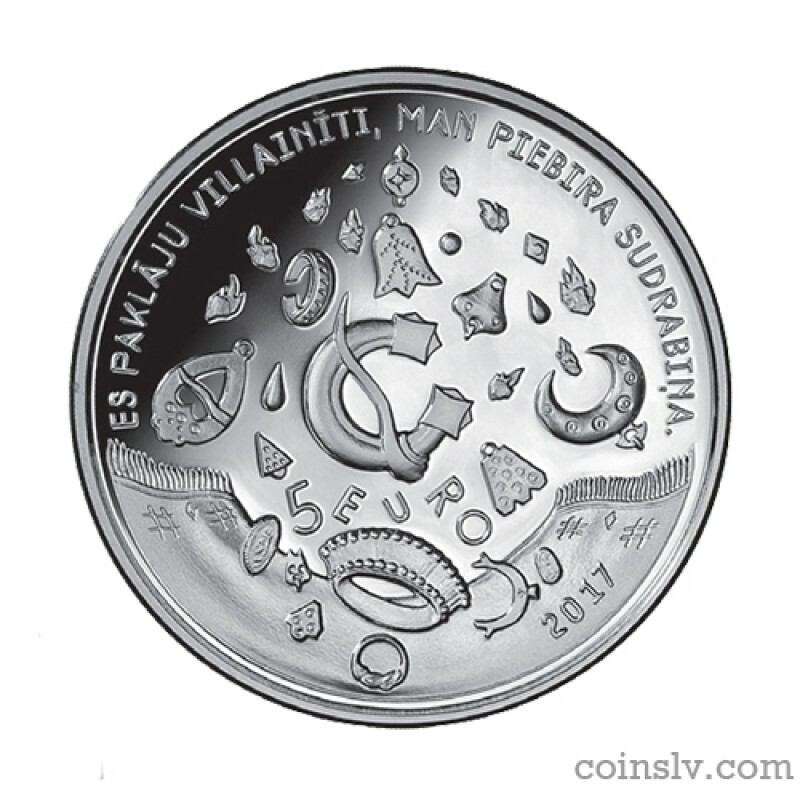 This Latvian folk song is featured on Latvijas Banka's collector coin which is dedicated to all Latvian folk songs and bears a poetical message enhanced by the drawings of artist Edgars Folks. The obverse of the coin features a bearded rider wearing an ancient Latvian hero's outfit and throwing lightning bolts all around. The reverse of the coin features a shawl spread on the ground and silver jewellery falling from the sky. The fierce rider personifies the element of nature pouring down from the heavens the nourishment required for fertility and prosperity. In the Latvian mythology, this heavenly smith is called Thunder or Father Thunder and he has quite a big family: mother, daughters, sons and even a daughter-in-law. Many folk songs mention as many as nine sons of Thunder who also play the pipe and beat the drums. The daughters of Thunder create rain, his wife sifts the rain, but she can also rumble. Father Thunder can be armed with a sword, a whip, an iron rod, a bolt, an arrow and a fiery bludgeon. His counterparts in the mythology of other nations are Jupiter, the ancient Roman god, and the mighty Zeus of the ancient Greeks. Thunder was very popular on the present-day territory of Latvia as suggested by, for example, an observation made by the Jesuits of Daugavpils in 1734 describing how mead was brought to the middle of a field as an offering to the Holy Thunder. Most of the time, Father Thunder only scares us and showers fertile rain on the fields. The silver drops quench the thirsty plants, make the farmers wealthier and the maidens of Riga can now wash their silk sheets. The silver is transformed into brooches, bracelets, rings, pins, crowns and other pieces of jewellery. Personification and worship of objects of nature and natural phenomena was so common in folk songs that this category of folk songs takes up quite a lot of space in Krišjānis Barons (1835–1923) Cabinet of Folk Songs which is featured on the list of Registered Heritage of UNESCO's Memory of the World Programme since 2001. Thunder or the Heavenly Smith is accompanied by Sun and the daughters of Sun, Moon and an array of stars. The Cabinet of Folk Songs, which is an original card catalogue of the first complete compilation of Latvian folk songs (1894–1915), has been included in the Folk Traditions section of the Latvian Cultural Canon as the compilation process was one of the first steps in the establishment of the Latvian nation. The perfect textual classification system, created for almost 218 thousand folk songs, groups the folk songs based on the stages of a human life and rituals or according to certain categories, i.e. folk songs related to work, war, annual festivities, mythical and naughty folk songs.